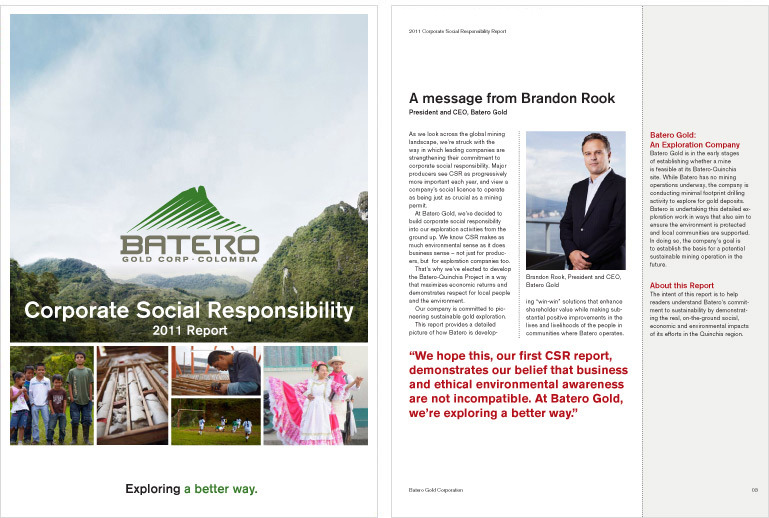 Batero Gold Corporate Sustainability Report — RandallAnthony Communications Inc. In 2011, as it pursued a potentially massive gold strike, Vancouver-based Batero Gold was setting new benchmarks for its sustainable and ethical approach to mining in Colombia. To communicate Batero’s sustainability strategy and progress, we designed a visually clean and cost-effective report that aligned with Batero’s brand. The report highlighted the company’s efforts to minimize its environmental impact while maximizing economic benefits to local communities – an approach that earned Batero broad support in Colombia.